Click the triangle to the left of the server running the DNS service. If you don’t see DNS listed, you need to turn it on. In Server Admin, click your server in the upper left of the window. Click the Settings icon in the toolbar and then select the DNS check box on the Services tab. Click the Save button at the bottom right. You should now see DNS listed under your server. Select DNS from the list of services under the server and then click the Zones icon in the toolbar. Select a zone from the list near the top of the window. If you don’t have a zone, create a primary zone with the Add Zone drop-down menu. This is the zone on which you create the MX record. Click the triangle next to your zone to expand a list under it. If there’s no Machine Record (A) for your Mail server, you need to add one. You don’t have to do it now; you can continue with creating an MX record. With your zone selected, go to the bottom of the window and click the Add (+) button next to the Mail Exchangers box. MX stands for mail exchange. Type the hostname of the Mail server in the Mail Exchangers box. 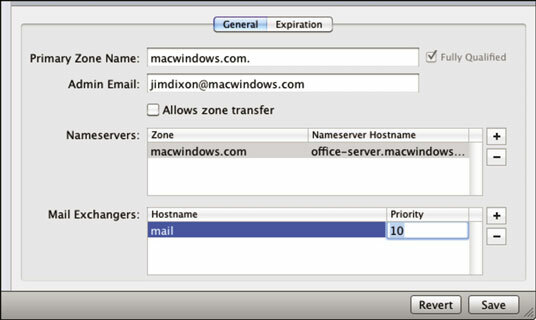 If you type just mail without the domain, the domain (in this example, .macwindows.com) is added when you click the Save button. Type a priority number in the Priority column. If this is your only Mail server, type 10. If this is a backup Mail server, the priority number should be higher than that of your primary Mail server. (Optional) If you have other Mail servers for redundancy, you can add more MX records by clicking the Add (+) button. Typically, the priority numbers are in multiples of 10 (10, 20, 30) to enable you to add other servers later between those numbers. Priority numbers tell the DNS server which Mail server to route incoming mail to. The highest priority has the lowest number, which is 10 in this example. If that server is out of commission, the mail is routed to the next priority number, 20.